Sports from Hell: My Search for the World's Dumbest Competition by Rick Reilly. Doubleday, 2010, 224 pages. For my bookish friends who are also in DC for ALA Annual, come see me in the Charlesbridge booth, #2710! Seven Year Switch by Claire Cook. Hyperion, 2010, 256 pages. The Double Comfort Safari Club by Alexander McCall Smith. Pantheon, 2010, 224 pages. dressed up like a book. The Unusual Mind of Vincent Shadow by Tim Kehoe. Little Brown, 2010, 185 pages. It's Not Summer Without You by Jenny Han. S&S, 2010, 275 pages. The Immortal Life of Henrietta Lacks by Rebecca Skloot. Crown, 2010, 369 pages. want to throw things at the grownups. Octavia Boone's Big Questions About Life, the Universe, and Everything by Rebecca Rupp. Candlewick, 2010, 192 pages. P.S. Bonus points for the Hitchhiker's reference in the title. boys you know. Do it! 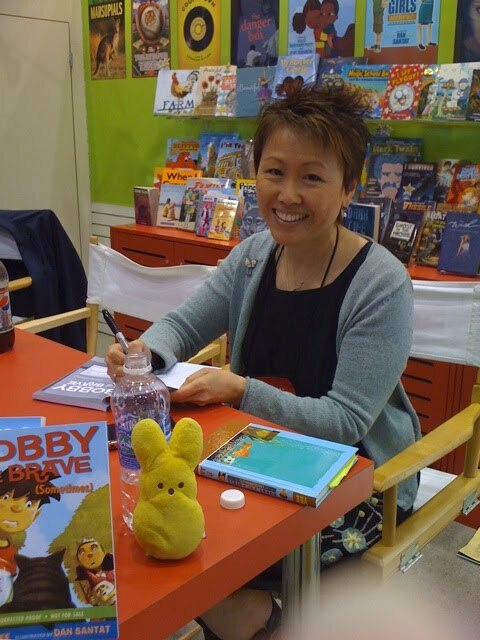 Bobby the Brave (Sometimes) by Lisa Yee. Levine/Scholastic, 2010, 176 pages. P.S. Look, she signed it!